“Making the euro area collectively responsible for potential costs without member states giving up any national sovereignty over fiscal and economic policies would, sooner or later, make the currency union more unstable,” they wrote. The experts’ report follows a claim in Der Spiegel that the German finance ministry was open to the idea of transferring German tax revenues to a eurozone budget. German government officials said these discussions were at an early stage and would require treaty changes. Problemet med climate change är inte att det blir tre grader varmare, vilket vore skönt i Sverige, utan att havsytan kan stiga tre meter. I dag är det dags för det tyska eldunderstödet till de italienska bröderna. A fiscal union should include a eurozone finance minister — an idea long favoured by Wolfgang Schäuble, Germany’s finance minister. Such a person would be accountable to a strengthened European Parliament with a new chamber for euro area issues. He or she could have the right to intervene in national budgets if these violate European law, such as the fiscal compact, and have a budget financed through a European tax as an add-on to either the value added tax or the corporate tax of euro area member states. The minister could have the ability to issue some jointly guaranteed debt within narrow limits. This ability to tax and borrow could be limited to two purposes: to provide unemployment insurance and to support investment. Das DIW Berlin - Deutsches Institut für Wirtschaftsforschung ist eines der größten Wirtschaftsforschungsinstitute in Deutschland. Als Mitglied der Leibniz-Gemeinschaft wird das DIW Berlin überwiegend aus öffentlichen Mitteln finanziert. I går skrev jag på denna blog att Krugman visar bristande militans. Hans skriver att The point is that it wasn’t at all hard to see, right from the beginning, that currency union without political union was a very dubious project. Detta kan leda tanken fel. Saken är den att Currency union with political union is an even more dubious project. Italy is calling for a wide set of measures — including the swift completion of banking union, the establishment of a common eurozone budget and the launch of a common unemployment insurance scheme — to reinforce the common currency. He said an elected eurozone parliament alongside the existing European Parliament and a European finance minister should also be considered. The Italian finance minister is confident this is the right path for the eurozone, but he is not certain it is a winning battle. Many eurozone governments, including Italy, are facing pressure from people who are increasingly sceptical about the merits of existing European economic integration, let alone the possibility of more to come. Detta är ett led i den stora konspirationen. "I am sure the euro will oblige us to introduce a new set of economic policy instruments. It is politically impossible to propose that now. But some day there will be a crisis and new instruments will be created." Men om man ställer till rejäla kriser, så kan varje nationell maktelit skrämma sitt folk till underkastelse. De tvingas acceptera. EU-kommissionens tidigare ordförande, virrpannan Romano Prodi, var så omedveten att han skrev en kolumn i självaste Financial Times (20 maj 2010), där han lugnt konstaterade att han och alla de andra som drev fram europrojektet naturligtvis visste att det skulle leda till en svår kris förr eller senare. In January 2010 two European economists /Lars Jonung and Eoin Drea/ published an article titled “It Can’t Happen, It’s a Bad Idea, It Won’t Last,” mocking American economists who had warned that the euro would cause big problems. The only big mistake of the euroskeptics was underestimating just how much damage the single currency would do. The point is that it wasn’t at all hard to see, right from the beginning, that currency union without political union was a very dubious project. So why did Europe go ahead with it? Mainly, I’d say, because the idea of the euro sounded so good. That is, it sounded forward-looking, European-minded, exactly the kind of thing that appeals to the kind of people who give speeches at Davos. Such people didn’t want nerdy economists telling them that their glamorous vision was a bad idea. RE: Currency union with political union is an even more dubious project. What I mean by “right” is the view expressed by Wolfgang Schäuble, Germany’s finance minister, that Greece should leave the euro, both for its own sake and that of the single currency itself. And even if you don’t think it is right, it is certainly logical. It is hard to find a better definition of “wrong” than the fiscal pact of 2012, which mandates a universally tight fiscal stance in the eurozone, regardless of whether a country has an affordable level of public debt, regardless of the cost of borrowing and regardless of the state of aggregate demand, and which simultaneously rejects any idea that countries with large current-account surpluses bear any responsibility for adjustment. For unreconstructed efficient market theorists, bubbles do not exist. For semi-reconstructed ones, they exist but, as former Federal Reserve chairman Alan Greenspan claimed in the late 1990s, they are perceptible only after the fact. To spot a bubble in advance, he declared, requires a judgment that hundreds of thousands of informed investors have it all wrong. Given that many spotted the dotcom bubble in advance and identified the property bubble before the credit crunch of 2007, the semi-reconstructed position seems almost as eccentric as the out-and-out efficient market stance. The eccentricity is further underlined by the fact that 2015 has witnessed two of the most readily detected bubbles in history. Martin Wolf: There are no /Greek/ government deficits to finance consumption (or almost none). So money would be used to pay interest and amounts due. There are no government deficits to finance consumption (or almost none). So money would be used to pay interest and amounts due. 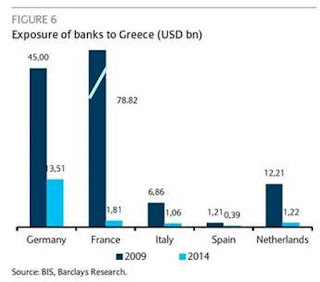 How much money will Greece use to roll over old loans? And how much is used to pay gov deficits for consumption? I am a bit ashamed not to know this. Om man ger ett treårigt lån till Grekland på t ex 100 miljarder euro, skall man då bli förvånad om Grekland efter tre år kommer tillbaka och vill låna 100 miljarder igen så att de kan lösa det förfallande lånet? Till min generade häpnad upptäcker jag att jag inte vet hur mycket av de pengar Grekland nu vill låna, i utbyte mot ytterligare nedskärningar, som skall gå till deras överkonsumtion och hur mycket som skall användas till att rulla runt tidigare lån. I länken finner du historisk data. Frågan om andelen som går till grekisk budget, rekapialisering av grekiska banker resp. återbetalning av skuld i framtiden vet vi inte då de två första variablerna är okända. Rolf Englund Det är väl en allvarlig brist i vår kunskap? The people has a right to know hur mycket som går till lata grekers pensioner och hur mycket som går tillbaka till EU? Jesper Katz: Visst vore det intressant att veta hur mycket som är verkligt nya pengar och hur stor andel bara är att ersätta gamla skulder med nya. Det skulle ge oss en siffra på hur mycket skattebetalarna i andra EU-länder skall ge till Grekland netto denna gång (även om det kommer kallas lån). Om greker flyttar sina pengar från grekiska till tyska banker, stiger då Greklands skulder? Det verkar lätt, men vänta bara till jag har förklarat det. Om greker tar ut lås oss säga en miljard euro ur grekiska banker och flyttar dem till t ex Deutsche Bank i Frankfurt, måste grekiska banker öka sin skuld till ECBs nödlånsprogram ELAS. Jaha, säger nyttiga idioter som Gunnar Hökmark, nu har Grekland slösat bort ytterligare en miljard euro. Men så är det ju inte. Donnerwetter säger onyttiga tyska idioter. Vi vill inte vara med om att betala lata slösaktiga grekers skulder. Det här borde man förstå utan att vara lika duktig som Varoufakis. En komplikation är dock att de flesta greker kommer att välja tyska banker framför grekiska de närmaste 40-50 åren. För säkerhets skull. Eurokriser har ju en tendens att återkomma. Hans finansministerkollegor i EU har blivit irriterad på honom. Han har nämligen använt dyrbar förhandlingstid till att förklara för dem att åtstramning inte leder till tillväxt och att s.k. strukturreformer, som höjning av momsen på elström, inte heller fixar Greklands ekonomi. Varoufakis har, till skillnad från t ex Gunnar Hökmark, inte hållit sig inom EU:s åsiktskorridor. The second error of the Yes campaign was a failure to explain how the bailout programme could work economically. This is not a debate between Keynesian and neoclassical economics, the kind that keeps us endlessly busy on these pages. The Greek referendum united economists with very diverse views of how the world works, including Paul Krugman, Jeffrey Sachs and Hans-Werner Sinn. There is no reputable economic theory according to which an economy that has experienced an eight-year-long depression requires a new round of austerity to bring about economic adjustment. “Soon after the announcement of the referendum results, I was made aware of a certain preference by some Eurogroup participants, and assorted ‘partners’, for my… ‘absence’ from its meetings; an idea that the Prime Minister judged to be potentially helpful to him in reaching an agreement. For this reason I am leaving the Ministry of Finance today,” he wrotein a blogpost, explaining his resignation. An Oxford-educated economist, Mr Tsakalotos has much in common with the political elite of Westminster, studying politics, philosophy and economics (PPE) as an undergraduate before completing his PhD in economics at Oxford in 1989. The 55-year-old, who was born in Rotterdam, currently serves as the chief economic spokesman and effective shadow finance minister for the Syriza-led government. IMFs standardrecept för länder i kris har länge varit åtstramning + devalvering. Åtstramningen leder till minskad inhemsk efterfrågan och devalvering medför ökad utländsk efterfrågan och ett bättre läge för de inhemska företag som konkurrerar med importerade varor. I fallet Grekland stödde IMF EUs recept om enbart åtstramning. Man kan ju inte devalvera om man inte har en egen valuta. Denna eftergivenhet mot önskemålen från Bryssel, Paris och Berlin är oförlåtliga. Jag inte bara varnar Bismarck. Jag kräver också att Mme Lagarde avgår. Grekland behöver 60 miljarder euro mer i bistånd, säger IMF i en rapport i dag torsdagen den 2 juli 2015. IMF-chefen Mme Lagarde, tidigare finansminister i eurolandet Frankrike, har fått stark även intern kritik för att hon har lånat ut så mycket pengar till ett EU-land. Nu är det så att IMF inte får låna ut pengar till ett land som Grekland, som ligger efter med sina betalningar till IMF. Vem skall då betala? Euroland, och då får IMF tillbaka sina pengar och Merkel, Hollande och Juncker får sitta med Svarte Petter. Det är rätt åt dom.